I actually have a perverse fondness for Bill Clinton. This is both because we got better policy while he was President (whether he deserves credit is a separate question) and because he single-handedly generated a lot of quality political humor. But that doesn’t mean he isn’t a typical politician. And the same is true for his wife. Indeed, they are strong candidates for the Hypocrisy-in-Government Award. That’s because they want to subject other people to the death tax, but they’re taking aggressive steps to make sure they aren’t subject to this punitive and immoral form of double taxation. Here’s some of what Bloomberg is reporting on the issue. 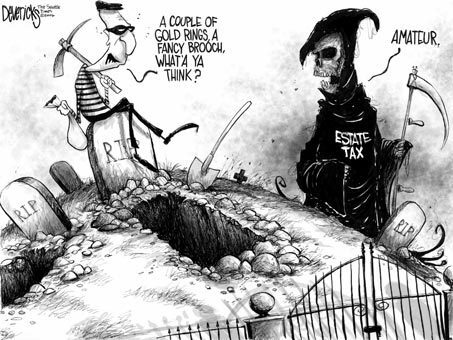 Bill and Hillary Clinton have long supported an estate tax… That doesn’t mean they want to pay it. To reduce the tax pinch, the Clintons are using financial planning strategies befitting the top 1 percent of U.S. households in wealth. These moves, common among multimillionaires, will help shield some of their estate from the tax that now tops out at 40 percent of assets upon death. The Clintons created residence trusts in 2010 and shifted ownership of their New York house into them in 2011, according to federal financial disclosures and local property records. But you have to give the Clintons credit for chutzpah. The Clintons’ finances are receiving attention as Hillary Clinton tours the country promoting her book, “Hard Choices.” She said in an interview on ABC television that the couple was “dead broke” and in debt when they left the White House in early 2001. 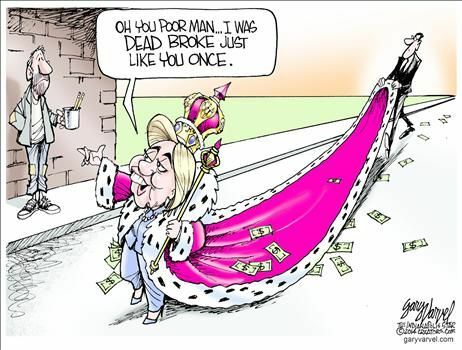 …The Clintons’ finances are receiving attention as Hillary Clinton tours the country promoting her book, “Hard Choices.” She said in an interview on ABC television that the couple was “dead broke” and in debt when they left the White House in early 2001. …Since she left the government last year, Hillary Clinton, 66, has been giving speeches for hundreds of thousands of dollars each. Bill Clinton, 67, also makes paid speeches and appearances, receiving $200,000 each in October 2012 from Vanguard Group Inc. and Deutsche Bank AG, according to Hillary Clinton’s disclosures. Geesh, I wish I was “dead broke” the same way. Political cartoonists certainly aren’t impressed. Here’s Gary Varvel’s take on the topic. Michael Ramirez, winner of my cartoon contest, also is unimpressed. By the way, Hillary was quoted in the Bloomberg story as being in favor of a meritocracy. Which makes you wonder whether she opposed the special sweetheart deal that her daughter received to work at NBC News. I have nothing against parents helping their kids and using their connections. I surely would help my kids if I had any influence in a hiring or pay decision. But this smells of cronyism. Let’s not forget that NBC is owned by General Electric, and GE is infamous for getting in bad with politicians in exchange for handouts and subsidies. In other words, it’s quite likely that Chelsea was given an extremely lucrative contract precisely because the company figured it was a good way of earning some chits with the then-Secretary of State and possible future President. I’m not aware of any smoking gun to confirm my suspicion, but it would take heroic naiveté to assume that Chelsea’s parents had nothing to do with NBC’s decisions. So, for their hypocrisy on both the death tax and meritocracy, the Clinton’s could win the Hypocrisy Award. But there are plenty of other worthy candidates. Such as the Paris-based Organization for Economic Cooperation and Development, which advocates higher tax for everyone else while providing gold-plated tax-free salaries and benefits to its own employees. Such as the leftist political types who say tax havens are bad and immoral while simultaneously utilizing these low-tax jurisdictions to protect and grow their own wealth. Such as the politicians and congressional staffers who decided to coerce others into Obamacare while seeking special exemptions for themselves. Such as the rich leftists who advocate higher taxes for other people even though they refuse to send more of their own money to Washington. Such as Prince Charles of the United Kingdom, who preaches coerced sacrifice for ordinary people even though his “carbon footprint” would be in the top 1 percent. Such as the statists who fight against school choice for poor families while sending their own kids to pricey private schools for the elite. Such as the Canadian politician who supports government-run healthcare for his constituents but comes to America for private treatment when he’s sick. As you can see, the Clintons face some very tough competition. They promote the cause of redistributing hundreds of billions. They get paid a few tenths of million. Its a fair compensation and a fair deal – hypocrisy or not. I’ll vote for them. Take $4 from people who are more intelligent, more competent, or simply harder working than I am, keep a few pennies, hand out $2 to cronies and then finally $1 to me, to insulate me from my mediocrity and so that I can sustain my top 5% worldwide standard of living as a member of the American middle class. At an American growth trendline of 2% annually, in a world riding a 4% growth trendline, it can last forever. Can’t it? kinda gives you goose bumps…. don’t it? 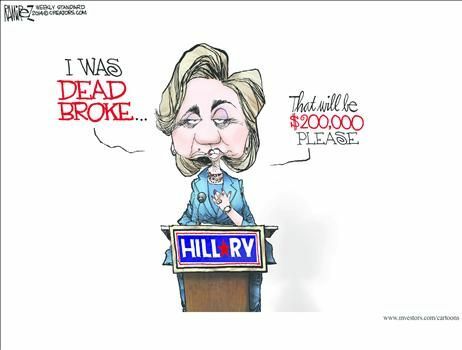 They were not “dead broke” when they left the White House. They were morally bankrupt.